In my original recipe, I used a spice grinder to pulverize the mushrooms—but to blitz this larger amount of dried porcinis, you’d be wise to use a higher-volume food processor or super-powered blender. Dump your dried ’shrooms in the food processor and pulse a few times to chop them up uniformly. If the lid of your food processor isn’t on tight, a fine mist of mushroom dust will erupt from the crack, so check the seal before you continue blitzing. In a large bowl, combine the powdered mushrooms, salt, red pepper flakes, dried thyme, and freshly cracked black pepper. Stir well to mix thoroughly. Once the red pepper flakes are evenly distributed, you’re all set! If you’re packaging this magical seasoning salt for your friends, print a set of labels on a full sheet of sticker paper. Carefully cut them out and stick them on 12 mini jars. Scoop out a scant ⅓ cup of the Magic Mushroom Powder, and place it on a piece of parchment paper. Pull up the sides of the parchment and use it as a funnel to transfer the seasoning salt into each jar. Warning: Do not open the container immediately after switching off your processor. A mushroom cloud will literally explode out of the top and you’ll find yourself coughing up Magic Mushroom Powder for the next few minutes. Instead, be patient and let the powder settle before you open it. 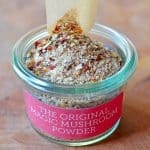 Don’t want to make your own Magic Mushroom Powder? Buy a tin at your local Whole Foods Market store!